Women soy farmers compare notes. Feed the Future week is September 12-16. Here’s one way Winrock is helping #EndHunger now. The humble soybean is one of the most nutritious foods on Earth, and its plants produce more protein per acre than almost any other use of land. Soybeans are also a mighty storehouse of vitamins and nutrients, including iron, fiber, vitamins B and K, magnesium, zinc and potassium. Though the world’s biggest producers (USA and Brazil) farm soybeans primarily for animal feed, in Burma (also known as Myanmar) — one of the poorest countries in Asia — thousands of smallholder farmers grow the healthful, nitrogen-fixing legumes on small parcels for humans to eat, selling primarily to domestic tofu processors. A USAID-funded Feed the Future project implemented by Winrock has directly assisted about 6,000 smallholder soy farmers in Southern Shan. Yet for all its wonderful properties, soy isn’t easy to grow, dry or store in Burma’s monsoonal climate. 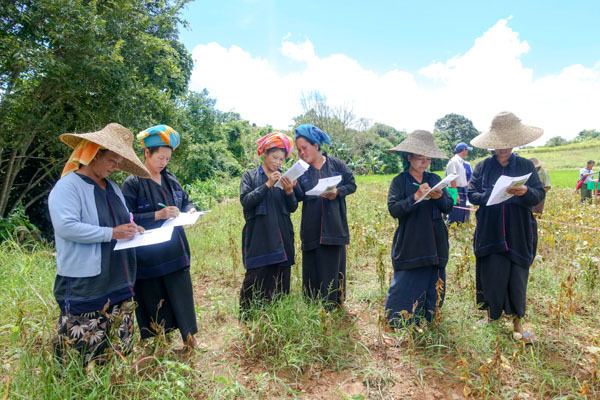 Limited knowledge of effective inputs, poor seed storage practices and lack of access to drying technology also cloud the forecast for smallholder soy growers in Burma. To help Burma’s soy farmers tackle these challenges and find new markets at a time when global demand for the crop is rising, a USAID-funded, Feed the Future project implemented by Winrock International is introducing improved, locally adapted seed varieties with varying maturation cycles, and is increasing local knowledge and access to new growing practices. It is also furthering access to new technology including handheld seeders, grain dryers, airtight storage bags and Rhizobium inoculant that can boost soy yields and profitability. 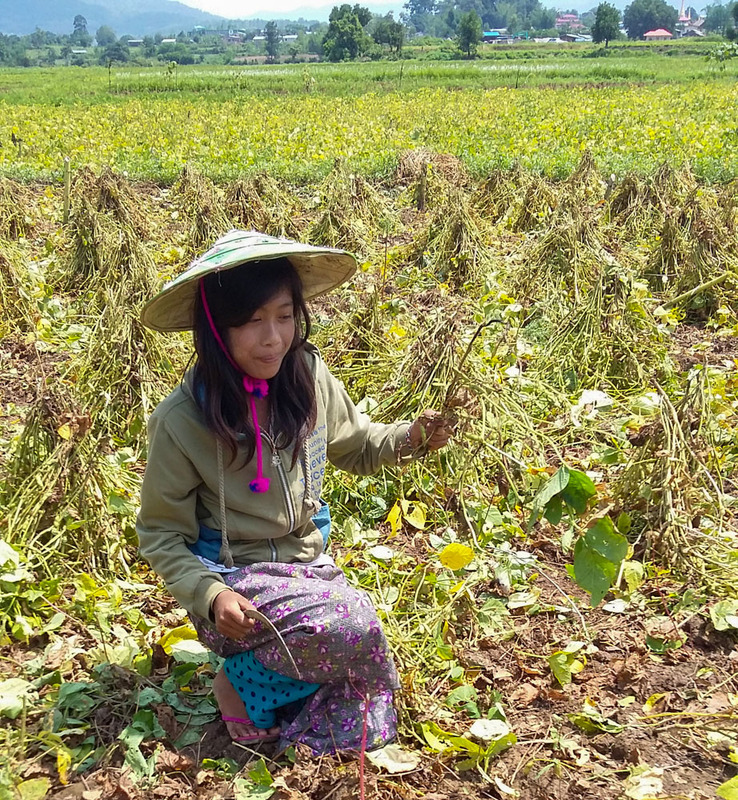 So far, the Value Chains for Rural Development project has directly assisted about 6,000 smallholder soy farmers in food insecure Shan State, with the goal of reaching a total of 12,000 soy farmers by 2019. The Value Chains for Rural Development project has introduced improved, locally adapted seed varieties. Here, Danu farmers in Southern Shan learn about new soy varieties. The Value Chains project also connects smallholder soy farmers to new, high-value markets. For example, a Rangoon-based tofu producer who attended a Value Chains workshop in 2016 forged a new connection with one of the country’s most successful, Western-style supermarket chains, City Mart. Daw Lai Lai Aung, owner of a tofu production business, learned at the workshop that Shan farmers were now producing higher-quality soybean using practices introduced by Winrock, and went to the field to see for herself. She came away impressed. After making adjustments to processing and food safety protocols to meet the supermarket’s requirements, Daw Lai Lai began buying soy at premium prices directly from Shan smallholders and is now selling tofu directly to City Mart and two other supermarket chains. Taking a private sector-led approach that links processors and retailers directly to motivated smallholders adopting improved practices, the Value Chains for Rural Development project is working to reduce food insecurity and contributing to agricultural and economic growth in Burma.